In the first millennium BC, Iranian nomads established irrigation systems along the rivers of Central Asia and built towns at Bukhara and Samarqand. These places became extremely wealthy points of transit on what became known as the Silk Road between China and Europe. In the seventh century AD, the Soghdian Iranians, who profited most visibly from this trade, saw their province of Transoxiana (Mawarannahr) overwhelmed by Arabs, who spread Islam throughout the region. Under the Arab Abbasid Caliphate, the eighth and ninth centuries were a golden age of learning and culture in Transoxiana. As Turks began entering the region from the north, they established new states, many of which were Persianate in nature. After a succession of states dominated the region, in the twelfth century, Transoxiana was united in a single state with Iran and the region of Khwarezm, south of the Aral Sea. In the early thirteenth century, that state was invaded by Mongols, led by Genghis Khan. Under his successors, Iranian-speaking communities were displaced from some parts of Central Asia. Under Timur (Tamerlane), Transoxiana began its last cultural flowering, centered in Samarqand. After Timur the state began to split, and by 1510 Uzbek tribes had conquered all of Central Asia. In the sixteenth century, the Uzbeks established two strong rival khanates, Bukhoro and Khorazm. In this period, the Silk Road cities began to decline as ocean trade flourished. The khanates were isolated by wars with Iran and weakened by attacks from northern nomads. Between 1729 and 1741 all the Khanates were made into vassals by Nader Shah of Persia. In the early nineteenth century, three Uzbek khanates—Bukhoro, Khiva, and Quqon (Kokand)—had a brief period of recovery. However, in the mid-nineteenth century Russia, attracted to the region's commercial potential and especially to its cotton, began the full military conquest of Central Asia. By 1876 Russia had incorporated all three khanates (hence all of present-day Uzbekistan) into its empire, granting the khanates limited autonomy. In the second half of the nineteenth century, the Russian population of Uzbekistan grew and some industrialization occurred. At the beginning of the twentieth century, the Jadidist movement of educated Central Asians, centered in present-day Uzbekistan, began to advocate overthrowing Russian rule. In 1916 violent opposition broke out in Uzbekistan and elsewhere, in response to the conscription of Central Asians into the Russian army fighting World War I. When the tsar was overthrown in 1917, Jadidists established a short-lived autonomous state at Quqon. After the Bolshevik Party gained power in Moscow, the Jadidists split between supporters of Russian communism and supporters of a widespread uprising that became known as the Basmachi Rebellion. As that revolt was being crushed in the early 1920s, local communist leaders such as Faizulla Khojayev gained power in Uzbekistan. In 1924 the Soviet Union established the Uzbek Soviet Socialist Republic, which included present-day Tajikistan and Uzbekistan. Tajikistan became the separate Tajik Soviet Socialist Republic in 1929. In the late 1920s and early 1930s, large-scale agricultural collectivization resulted in widespread famine in Central Asia. In the late 1930s, Khojayev and the entire leadership of the Uzbek Republic were purged and executed by Soviet leader Joseph V. Stalin (in power 1927–53) and replaced by Russian officials. The Russification of political and economic life in Uzbekistan that began in the 1930s continued through the 1970s. During World War II, Stalin exiled entire national groups from the Caucasus and the Crimea to Uzbekistan to prevent "subversive" activity against the war effort. Moscow’s control over Uzbekistan weakened in the 1970s as Uzbek party leader Sharaf Rashidov brought many cronies and relatives into positions of power. In the mid-1980s, Moscow attempted to regain control by again purging the entire Uzbek party leadership. However, this move increased Uzbek nationalism, which had long resented Soviet policies such as the imposition of cotton monoculture and the suppression of Islamic traditions. In the late 1980s, the liberalized atmosphere of the Soviet Union under Mikhail S. Gorbachev (in power 1985–91) fostered political opposition groups and open (albeit limited) opposition to Soviet policy in Uzbekistan. In 1989 a series of violent ethnic clashes involving Uzbeks brought the appointment of ethnic Uzbek outsider Islam Karimov as Communist Party chief. When the Supreme Soviet of Uzbekistan reluctantly approved independence from the Soviet Union in 1991, Karimov became president of the Republic of Uzbekistan. In 1992 Uzbekistan adopted a new constitution, but the main opposition party, Birlik, was banned, and a pattern of media suppression began. In 1995 a national referendum extended Karimov’s term of office from 1997 to 2000. A series of violent incidents in eastern Uzbekistan in 1998 and 1999 intensified government activity against Islamic extremist groups, other forms of opposition, and minorities. In 2000 Karimov was reelected overwhelmingly in an election whose procedures received international criticism. Later that year, Uzbekistan began laying mines along the Tajikistan border, creating a serious new regional issue and intensifying Uzbekistan’s image as a regional hegemon. In the early 2000s, tensions also developed with neighboring states Kyrgyzstan and Turkmenistan. In the mid-2000s, a mutual defense treaty substantially enhanced relations between Russia and Uzbekistan. Tension with Kyrgyzstan increased in 2006 when Uzbekistan demanded extradition of hundreds of refugees who had fled from Andijon into Kyrgyzstan after the riots. A series of border incidents also inflamed tensions with neighboring Tajikistan. In 2006 Karimov continued arbitrary dismissals and shifts of subordinates in the government, including one deputy prime minister. In 1938 A. Okladnikov discovered the 70,000-year-old skull of an 8- to 11-year-old Neanderthal child in Teshik-Tash in Uzbekistan. 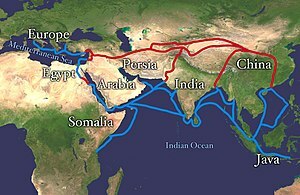 The Silk Road extending from Southern Europe through Africa and Western Asia, to Central Asia, and eventually South Asia, until it reaches China, East Asia proper, and Southeast Asia. Alexander the Great conquered the region in 328 BC, bringing it briefly under the control of his Macedonian Empire. The wealth of Transoxiana was a constant magnet for invasions from the northern steppes and from China. Numerous intraregional wars were fought between Soghdian states and the other states in Transoxiana, and the Persians and the Chinese were in perpetual conflict over the region. The Chinese in particular sought the Heavenly Horses from the region, going so far as to wage a siege war against Dayuan, an urbanized civilization in the Fergana Valley in 104 BC to obtain the horses. In the same centuries, however, the region also was an important center of intellectual life and religion. Until the first centuries after Christ, the dominant religion in the region was Zoroastrianism, but Buddhism, Manichaeism, and Christianity also attracted large numbers of followers. Despite brief Arab rule, Central Asia successfully retained much of its Iranian characteristic, remaining an important center of culture and trade for centuries after the adoption of the new religion. Transoxiana continued to be an important political player in regional affairs, as it had been under various Persian dynasties. In fact, the Abbasid Caliphate, which ruled the Arab world for five centuries beginning in 750, was established thanks in great part to assistance from Central Asian supporters in their struggle against the then-ruling Umayyad Caliphate. During the height of the Abbasid Caliphate in the eighth and the ninth centuries, Central Asia and Transoxiana experienced a truly golden age. Bukhoro became one of the leading centers of learning, culture, and art in the Muslim world, its magnificence rivaling contemporaneous cultural centers such as Baghdad, Cairo, and Cordoba. Some of the greatest historians, scientists, and geographers in the history of Islamic culture were natives of the region. As the Abbasid Caliphate began to weaken and local Islamic Iranian states emerged as the rulers of Iran and Central Asia, the Persian language continued its preeminent role in the region as the language of literature and government. The rulers of the eastern section of Iran and of Transoxiana were Persians. Under the Samanids and the Buyids, the rich Perso-Islamic culture of Transoxiana continued to flourish. The first of the Turkic states in the region was the Persianate Ghaznavid Empire, established in the last years of the tenth century. The Ghaznavid state, which captured the Samanid domains south of the Amu Darya, was able to conquer large areas of eastern Iran, Central Asia, Afghanistan, and Pakistan during the reign of Sultan Mahmud. The Ghaznavids were closely followed by the Turkic Qarakhanids, who took the Samanid capital Bukhara in 999 AD, and ruled Transoxiana for the next two centuries. 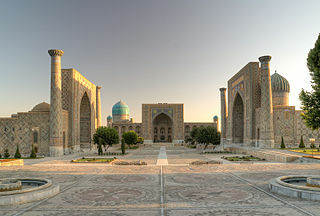 Samarkand was made the capital of the Western Qarakhanid state. The dominance of Ghazna was curtailed, however, when the Seljuks led themselves into the western part of the region, conquering the Ghaznavid territory of Khorazm (also spelled Khorezm and Khwarazm). The Seljuks also defeated the Karakhanids, but did not annex their territories outright. Instead they made the Karakhanids a vassal state. The Seljuks dominated a wide area from Asia Minor, Iran, Iraq, and parts of the Caucasus, to the western sections of Transoxiana, in Afghanistan, in the eleventh century. The Seljuk Empire then split into states ruled by various local Turkic and Iranian rulers. The culture and intellectual life of the region continued unaffected by such political changes, however. Turkic tribes from the north continued to migrate into the region during this period. The power of the Seljuks however became diminished when the Seljuk Sultan Ahmed Sanjar was defeated by the Kara-Khitans at the Battle of Qatwan in 1141. In the late twelfth century, a Turkic leader of Khorazm, which is the region south of the Aral Sea, united Khorazm, Transoxiana, and Iran under his rule. Under the rule of the Khorazm shah Kutbeddin Muhammad and his son, Muhammad II, Transoxiana continued to be prosperous and rich while maintaining the region's Perso-Islamic identity. However, a new incursion of nomads from the north soon changed this situation. This time the invader was Genghis Khan with his Mongol armies. The Mongols, under Genghis Khan (pictured), conquered Central Asia in the early thirteenth century. Following the death of Genghis Khan in 1227, his empire was divided among his four sons and his family members. Despite the potential for serious fragmentation, Mongol law of the Mongol Empire maintained orderly succession for several more generations, and control of most of Mawarannahr stayed in the hands of direct descendants of Chaghatai, the second son of Genghis. Orderly succession, prosperity, and internal peace prevailed in the Chaghatai lands, and the Mongol Empire as a whole remained strong and united. [full citation needed] But, Khwarezm was part of Golden Horde. In the early fourteenth century, however, as the empire began to break up into its constituent parts, the Chaghatai territory also was disrupted as the princes of various tribal groups competed for influence. One tribal chieftain, Timur (Tamerlane), emerged from these struggles in the 1380s as the dominant force in Mawarannahr. Although he was not a descendant of Genghis, Timur became the de facto ruler of Mawarannahr and proceeded to conquer all of western Central Asia, Iran, Asia Minor, and the southern steppe region north of the Aral Sea. He also invaded Russia before dying during an invasion of China in 1405. 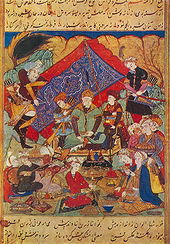 Timur initiated the last flowering of Mawarannahr by gathering in his capital, Samarqand, numerous artisans and scholars from the lands he had conquered. By supporting such people, Timur imbued his empire with a very rich Perso-Islamic culture. During Timur's reign and the reigns of his immediate descendants, a wide range of religious and palatial construction projects were undertaken in Samarqand and other population centers. Timur also patronized scientists and artists; his grandson Ulugh Beg was one of the world's first great astronomers. It was during the Timurid dynasty that Turkic, in the form of the Chaghatai dialect, became a literary language in its own right in Mawarannahr, although the Timurids were Persianate in nature. The greatest Chaghataid writer, Ali Shir Nava'i, was active in the city of Herat, now in northwestern Afghanistan, in the second half of the fifteenth century. The Timurid state quickly broke into two halves after the death of Timur. The chronic internal fighting of the Timurids attracted the attention of the Uzbek nomadic tribes living to the north of the Aral Sea. In 1501 the Uzbeks began a wholesale invasion of Mawarannahr. The Uzbeks' struggle with Iran also led to the cultural isolation of Central Asia from the rest of the Islamic world. In addition to these problems, the struggle with the nomads from the northern steppe continued. In the seventeenth and eighteenth centuries, Kazakh nomads and Mongols continually raided the Uzbek khanates, causing widespread damage and disruption. In the beginning of the eighteenth century, the Khanate of Bukhoro lost the fertile Fergana region, and a new Uzbek khanate was formed in Quqon. Meanwhile, in the late eighteenth and early nineteenth centuries new dynasties led the khanates to a period of recovery. Those dynasties were the Qongrats in Khiva, the Manghits in Bukhoro, and the Mins in Quqon. These new dynasties established centralized states with standing armies and new irrigation works. But their rise coincided with the ascendance of Russian power in the Kazakh steppes and the establishment of a British position in Afghanistan. By the early nineteenth century, the region was caught between these two powerful European competitors, each of which tried to add Central Asia to its empire in what came to be known as the Great Game. The Central Asians, who did not realize the dangerous position they were in, continued to waste their strength in wars among themselves and in pointless campaigns of conquest. The Defence of the Samarkand Citadel in 1868. From the Russian illustrated magazine Niva (1872). As soon as the Russian conquest of the Caucasus was completed in the late 1850s, the Russian Ministry of War began to send military forces against the Central Asian khanates. Three major population centers of the khanates—Tashkent, Bukhoro, and Samarqand—were captured in 1865, 1867, and 1868, respectively. In 1868 the Khanate of Bukhoro signed a treaty with Russia making Bukhoro a Russian protectorate. In 1868 the Khanate of Kokand was confined to the Ferghana Valley and in 1876 it was annexed. The Khanate of Khiva became a Russian protectorate in 1873. Thus by 1876 the entire territory comprising present-day Uzbekistan either had fallen under direct Russian rule or had become a protectorate of Russia. The treaties establishing the protectorates over Bukhoro and Khiva gave Russia control of the foreign relations of these states and gave Russian merchants important concessions in foreign trade; the khanates retained control of their own internal affairs. Tashkent and Quqon fell directly under a Russian governor general. During the first few decades of Russian rule, the daily life of the Central Asians did not change greatly. The Russians substantially increased cotton production, but otherwise they interfered little with the indigenous people. Some Russian settlements were built next to the established cities of Tashkent and Samarqand, but the Russians did not mix with the indigenous populations. The era of Russian rule did produce important social and economic changes for some Uzbeks as a new middle class developed and some peasants were affected by the increased emphasis on cotton cultivation. In the last decade of the nineteenth century, conditions began to change as new Russian railroads brought greater numbers of Russians into the area. In the 1890s, several revolts, which were put down easily, led to increased Russian vigilance in the region. The Russians increasingly intruded in the internal affairs of the khanates. The only avenue for Uzbek resistance to Russian rule became the Pan-Turkish movement, also known as Jadidism, which had arisen in the 1860s among intellectuals who sought to preserve indigenous Islamic Central Asian culture from Russian encroachment. By 1900 Jadidism had developed into the region's first major movement of political resistance. Until the Bolshevik Revolution of 1917, the modern, secular ideas of Jadidism faced resistance from both the Russians and the Uzbek khans, who had differing reasons to fear the movement. Prior to the events of 1917, Russian rule had brought some industrial development in sectors directly connected with cotton. Although railroads and cotton-ginning machinery advanced, the Central Asian textile industry was slow to develop because the cotton crop was shipped to Russia for processing. As the tsarist government expanded the cultivation of cotton dramatically, it changed the balance between cotton and food production, creating some problems in food supply—although in the prerevolutionary period Central Asia remained largely self-sufficient in food. This situation was to change during the Soviet period when the Moscow government began a ruthless drive for national self-sufficiency in cotton. This policy converted almost the entire agricultural economy of Uzbekistan to cotton production, bringing a series of consequences whose harm still is felt today in Uzbekistan and other republics. After 1900 the khanates continued to enjoy a certain degree of autonomy in their internal affairs. However, they ultimately were subservient to the Russian governor general in Tashkent, who ruled the region in the name of Tsar Nicholas II. The Russian Empire exercised direct control over large tracts of territory in Central Asia, allowing the khanates to rule a large portion of their ancient lands for themselves. In this period, large numbers of Russians, attracted by the climate and the available land, immigrated into Central Asia. After 1900, increased contact with Russian civilization began to affect the lives of Central Asians in the larger population centers where the Russians settled. In the summer of 1916, a number of settlements in eastern Uzbekistan were the sites of violent demonstrations against a new Russian decree canceling the Central Asians' immunity to conscription for duty in World War I. Reprisals of increasing violence ensued, and the struggle spread from Uzbekistan into Kyrgyz and Kazak territory. There, Russian confiscation of grazing land already had created animosity not present in the Uzbek population, which was concerned mainly with preserving its rights. The next opportunity for the Jadidists presented itself in 1917 with the outbreak of the February and October revolutions in Russia. In February the revolutionary events in Russia's capital, Petrograd (St. Petersburg), were quickly repeated in Tashkent, where the tsarist administration of the governor general was overthrown. In its place, a dual system was established, combining a provisional government with direct Soviet power and completely excluding the native Muslim population from power. Indigenous leaders, including some of the Jadidists, attempted to set up an autonomous government in the city of Quqon in the Fergana Valley, but this attempt was quickly crushed. 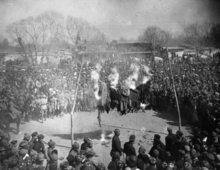 Following the suppression of autonomy in Quqon, Jadidists and other loosely connected factions began what was called the Basmachi revolt against Soviet rule, which by 1922 had survived the civil war and was asserting greater power over most of Central Asia. For more than a decade, Basmachi guerrilla fighters (that name was a derogatory Slavic term that the fighters did not apply to themselves) fiercely resisted the establishment of Soviet rule in parts of Central Asia. However, the majority of Jadidists, including leaders such as Abdurrauf Fitrat and Fayzulla Khodzhayev, cast their lot with the communists. In 1920 Khojayev, who became first secretary of the Communist Party of Uzbekistan, assisted communist forces in the capture of Bukhoro and Khiva. After the Amir of Bukhoro had joined the Basmachi movement, Khojayev became president of the newly established Bukharan People's Soviet Republic. A People's Republic of Khorezm also was set up in what had been Khiva. The Basmachi revolt eventually was crushed as the civil war in Russia ended and the communists drew away large portions of the Central Asian population with promises of local political autonomy and the potential economic autonomy of Soviet leader Lenin's New Economic Policy. Under these circumstances, large numbers of Central Asians joined the communist party, many gaining high positions in the government of the Uzbek Soviet Socialist Republic (Uzbek SSR), the administrative unit established in 1924 to include present-day Uzbekistan and Tajikistan. The indigenous leaders cooperated closely with the communist government in enforcing policies designed to alter the traditional society of the region: the emancipation of women, the redistribution of land, and mass literacy campaigns. Following the death of Joseph Stalin in 1953, the relative relaxation of totalitarian control initiated by First Secretary Nikita Khrushchev (in office 1953-64) brought the rehabilitation of some of the Uzbek nationalists who had been purged. More Uzbeks began to join the Communist Party of Uzbekistan and to assume positions in the government. However, those Uzbeks who participated in the regime did so on Russian terms. [unreliable source?] Russian was the language of state, and Russification was the prerequisite for obtaining a position in the government or the party. Those who did not or could not abandon their Uzbek lifestyles and identities were excluded from leading roles in official Uzbek society. Because of these conditions, Uzbekistan gained a reputation as one of the most politically conservative republics in the Soviet Union. As Uzbeks were beginning to gain leading positions in society, they also were establishing or reviving unofficial networks based on regional and clan loyalties. These networks provided their members support and often profitable connections between them and the state and the party. An extreme example of this phenomenon occurred under the leadership of Sharaf Rashidov, who was first secretary of the Communist Party of Uzbekistan from 1959 to 1982. During his tenure, Rashidov brought numerous relatives and associates from his native region into government and party leadership positions. The individuals who thus became "connected" treated their positions as personal fiefdoms to enrich themselves. In this way, Rashidov was able to initiate efforts to make Uzbekistan less subservient to Moscow. As became apparent after his death, Rashidov's strategy had been to remain a loyal ally of Leonid Brezhnev, leader of the Soviet Union from 1964 to 1982, by bribing high officials of the central government. With this advantage, the Uzbek government was allowed to merely feign compliance with Moscow's demands for increasingly higher cotton quotas. In 1989 ethnic animosities came to a head in the Fergana Valley, where local Meskhetian Turks were assaulted by Uzbeks, and in the Kyrgyz city of Osh, where Uzbek and Kyrgyz youth clashed. Moscow's response to this violence was a reduction of the purges and the appointment of Islam Karimov as first secretary of the Communist Party of Uzbekistan. The appointment of Karimov, who was not a member of the local party elite, signified that Moscow wanted to lessen tensions by appointing an outsider who had not been involved in the purges. Resentment among Uzbeks continued to smolder, however, in the liberalized atmosphere of Soviet leader Mikhail Gorbachev's policies of perestroika and glasnost. With the emergence of new opportunities to express dissent, Uzbeks expressed their grievances over the cotton scandal, the purges, and other long-unspoken resentments. These included the environmental situation in the republic, recently exposed as a catastrophe as a result of the long emphasis on heavy industry and a relentless pursuit of cotton. Other grievances included discrimination and persecution experienced by Uzbek recruits in the Soviet army and the lack of investment in industrial development in the republic to provide jobs for the ever-increasing population. Although Uzbekistan had not sought independence, when events brought them to that point, Karimov and his government moved quickly to adapt themselves to the new realities. They realized that under the Commonwealth of Independent States, the loose federation proposed to replace the Soviet Union, no central government would provide the subsidies to which Uzbek governments had become accustomed for the previous 70 years. Old economic ties would have to be reexamined and new markets and economic mechanisms established. Although Uzbekistan as defined by the Soviets had never had independent foreign relations, diplomatic relations would have to be established with foreign countries quickly. Investment and foreign credits would have to be attracted, a formidable challenge in light of Western restrictions on financial aid to nations restricting expression of political dissent. For example, the suppression of internal dissent in 1992 and 1993 had an unexpectedly chilling effect on foreign investment. Uzbekistan's image in the West alternated in the ensuing years between an attractive, stable experimental zone for investment and a post-Soviet dictatorship whose human rights record made financial aid inadvisable. Such alternation exerted strong influence on the political and economic fortunes of the new republic in its first five years. The activities of missionaries from some Islamic countries, coupled with the absence of real opportunities to participate in public affairs, contributed to the popularization of a radical interpretation of Islam. In the February 1999 Tashkent bombings, car bombs hit Tashkent and President Karimov narrowly escaped an assassination attempt. The government blamed the Islamic Movement of Uzbekistan (IMU) for the attacks. Thousands of people suspected of complicity were arrested and imprisoned. In August 2000, militant groups tried to penetrate Uzbek territory from Kyrgyzstan; acts of armed violence were noted in the southern part of the country as well. In March 2004, another wave of attacks shook the country. These were reportedly committed by an international terrorist network. An explosion in the central part of Bukhara killed ten people in a house allegedly used by terrorists on March 28, 2004. Later that day, policemen were attacked at a factory, and early the following morning a police traffic check point was attacked. The violence escalated on March 29, when two women separately set off bombs near the main bazaar in Tashkent, killing two people and injuring around 20. These were the first suicide bombers in Uzbekistan. On the same day, three police officers were shot dead. In Bukhara, another explosion at a suspected terrorist bomb factory caused ten fatalities. The following day police raided an alleged militant hideout south of the capital city. President Karimov claimed the attacks were probably the work of a banned radical group Hizb ut-Tahrir ("The Party of Liberation"), although the group denied responsibility. Other groups that might have been responsible include militant groups operating from camps in Tajikistan and Afghanistan and opposed to the government's support of the United States since September 11, 2001. In 2004, British ambassador Craig Murray was removed from his post after speaking out against the regime's human rights abuses and British collusion therein. On July 30, 2004, terrorists bombed the embassies of Israel and the United States in Tashkent, killing three people and wounding several. The Jihad Group in Uzbekistan posted a claim of responsibility for those attacks on a website linked to Al-Qaeda. Terrorism experts say the reason for the attacks is Uzbekistan's support of the United States and its War on terror. In July 2005, the Uzbek government gave the US 180 days' notice to leave the airbase it had leased in Uzbekistan. A Russian airbase and a German airbase remain. In December 2007 Islam A. Karimov was reelected to power in a fraudulent election. Western election observers noted that the election failed to meet many OSCE benchmarks for democratic elections, the elections were held in a strictly controlled environment, and there had been no real opposition since all the candidates publicly endorsed the incumbent. Human rights activists reported various cases of multiple voting throughout the country as well as official pressure on voters at polling stations to cast ballots for Karimov. The BBC reported that many people were afraid to vote for anyone other than the president. According to the constitution Karimov was ineligible to stand as a candidate, having already served two consecutive presidential terms and thus his candidature was illegal. The lead up to the elections was characterized by the secret police arresting dozens of opposition activists and putting them in jail including Yusuf Djumayaev, an opposition poet. Several news organizations, including The New York Times, the BBC and the Associated Press, were denied credentials to cover the election. Around 300 dissidents were in jail in 2007, including Jamshid Karimov, the president's 41-year-old nephew. In 2016, Karimov died, still being a president and was replaced by Shavkat Mirziyoyev. 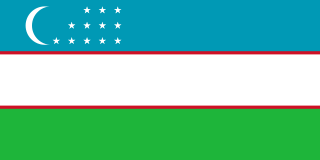 ^ a b c d e "Country Profile: Uzbekistan". Library of Congress Federal Research Division (February 2007). This article incorporates text from this source, which is in the public domain. ^ "Teshik-Tash | The Smithsonian Institution's Human Origins Program". Humanorigins.si.edu. 2010-03-24. Retrieved 2013-09-15. ^ a b c Lubin, Nancy. "Early history". In Curtis. ^ a b Lubin, Nancy. "Arrival of the Russians". In Curtis. ^ a b c d e Lubin, Nancy. "Russian conquest". In Curtis. ^ a b Lubin, Nancy. "Entering the twentieth century". In Curtis. ^ a b c d e Lubin, Nancy. "The Jadidists and Basmachis". In Curtis. ^ a b Lubin, Nancy. "The Stalinist period". In Curtis. ^ a b c d Lubin, Nancy. "Russification and resistance". In Curtis. ^ a b c d Lubin, Nancy. "The 1980s". In Curtis. ^ a b Lubin, Nancy. "Independence". A Country Study: Uzbekistan (Glenn E. Curtis, editor). Library of Congress Federal Research Division (March 1996). This article incorporates text from this source, which is in the public domain. ^ MacAskill, Ewen (October 22, 2004). "Ex-envoy to face discipline charges, says FO". The Guardian. London. Retrieved May 4, 2010. ^ "Uzbek president wins third term". BBC News. 2007-12-24. Retrieved January 5, 2010. ^ a b Stern, David L. (2007-12-25). "Uzbekistan Re-elects Its President". The New York Times. Retrieved May 4, 2010. ^ a b Harding, Luke (2007-12-24). "Uzbek president returned in election 'farce'". London: The Guardian. Retrieved May 4, 2010. Curtis, Glenn E., editor. A Country Study: Uzbekistan. Library of Congress Federal Research Division (March 1996). This article incorporates text from this source, which is in the public domain. 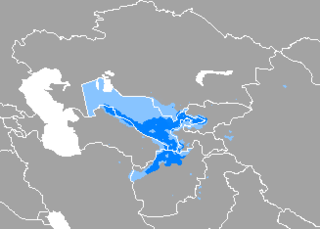 Tajikistan harkens to the Samanid Empire (875–999). The Tajik people came under Russian rule in the 1860s. The Basmachi revolt broke out in the wake of the Russian Revolution of 1917 and was quelled in the early 1920s during the Russian Civil War. In 1924 Tajikistan became an Autonomous Soviet Socialist Republics of the Soviet Union, the Tajik ASSR, within Uzbekistan. In 1929 Tajikistan was made one of the component republics of the Soviet Union – Tajik Soviet Socialist Republic – and it kept that status until gaining independence 1991 after the dissolution of the Soviet Union. The Fergana Valley is a valley in Central Asia spread across eastern Uzbekistan, southern Kyrgyzstan and northern Tajikistan. Khiva is a city of approximately 90,000 people located in Xorazm Region, Uzbekistan. According to archaeological data, the city was established in the beginning of the Christian era. It is the former capital of Khwarezmia and the Khanate of Khiva. Itchan Kala in Khiva was the first site in Uzbekistan to be inscribed in the World Heritage List (1991). The astronomer, historian and polymath, Al-Biruni was among several Muslim scholars born here. The Kazakh Khanate was a successor of the Golden Horde existing from the 15th to 19th century, located roughly on the territory of the present-day Republic of Kazakhstan. At its height, the khanate ruled from eastern Cumania to most of Uzbekistan, Karakalpakstan and the Syr Darya river with military confrontation as far as Astrakhan and Khorasan Province, which are now in Russia and Iran, respectively. The Khanate was later weakened by a series of Oirat and Dzungar invasions, devastating raids and warfare. These resulted in a decline and further disintegration into three Jüz-es, which gradually lost their sovereignty and were incorporated to the expanding Russian Empire. Its establishment marked the beginning of Kazakh statehood whose 550th anniversary was celebrated in 2015. Kyrgyzstan–Uzbekistan relations refers to the bilateral diplomatic relations between the Republic of Uzbekistan and the Kyrgyz Republic. Uzbekistan dominates southern Kyrgyzstan both economically and politically, based on the large Uzbek population in that region of Kyrgyzstan and on economic and geographic conditions. Much of Kyrgyzstan depends entirely on Uzbekistan for natural gas; on several occasions, Uzbekistan president Islam Karimov has achieved political ends by shutting pipelines or by adjusting terms of delivery. In a number of television appearances broadcast in the Osh and Jalal-Abad provinces of Kyrgyzstan, Karimov has addressed Akayev with considerable condescension; Akayev, in turn, has been highly deferential to his much stronger neighbor. Although Uzbekistan has not shown overt expansionist tendencies, the Kyrgyz government is acutely aware of the implications of Karimov's assertions that he is responsible for the well-being of all Uzbeks, regardless of their nation of residence. The Kyrgyz deposed President said in an interview "It is like we are heroin addicts but instead of heroin its energy we are addicted to-but not addicted as such, we just need it like everybody else does, so in fact heroin makes a bad comparison but I will stick with it- anyway its like Uzbekistan is our dealer, this is where the comparison is good, because heroin dealers are nasty and so is Uzbekistan, they play games, they get us to sell our bodies for the heroin, our bodies being bread, land and labor. Like a pimp they do not give us a fair deal though and thus we are exploited. The situation is clear when one considers it in these terms."